This patient was unsatisfied with previous surgery from other clinic so she visited Teuim clinic to correct frontal double eyelid line and do magic epicanthoplasty. The bigger the double eyelids are, and the more it is designed outlined, the greater the importance of epicanthoplasty is. Especially for large out line type double eyelid, adequate epicanthoplasty should be performed to avoid unnatural, sausage-like double eyelid. Asians have Mongolian fold that prevents from forming natural outline, and even if it is formed, it is unstable. 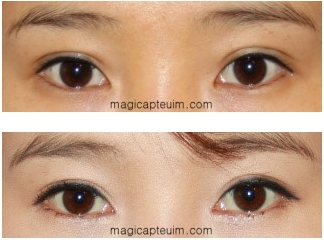 Unless your eyes are fairly protruding and Mongolian fold is very weak, it is medically difficult to obtain natural outline double eyelid without epicanthoplasty. When non-incision outline double eyelid surgery is done without epicanthoplasty, the swelling is very long-lasting and more likely to be released as it gradually weakens. Also the line looks awkward and difficult to express bright eye. Sausage double eyelid can be formed if patient with Mongolian fold do incision outline double eyelid surgery. And certain degrees of ptosis can accur, which leads to pthosis correction when doing revion surgery. If you want large outline double eyelid, releasing tension of inner corner of the eyes by improving Mongolian fold is essential for natural double eyelids. It is a medical fact that the structure of Asian's eyes are different from Caucasian's and therefore hard to make natural double eyelid. IF your eye structure is relatively favorable to form outline- double eyelid, improving inner corner of your eyes by epicanthoplasty can bring you more possibility to express more natural double eyelid. To obtain natural outline double eyelid, it is very important to get surgery at clinics famous for epicanthoplasty and where they can optimized the relationship between double eyelid and epicanthoplasty.